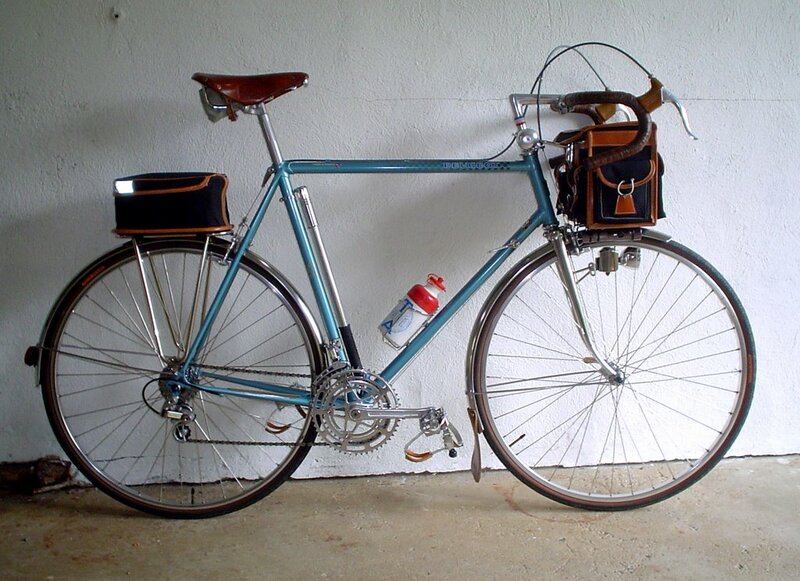 I asked Steve Hampsten to send a few photos of one of the terrific Tournesol bikes he builds. To be honest, I was hoping for pictures of one of the carbon fiber randonneus he creates. But his new 650b bike is even better. This is Steve's personal bike and it reflects his opinion that bikes should be built to be used. We spoke today and both agreed that some of the top end bikes are so superbly finished and expensive that their owners might be afraid to take them on a dirt road. So Steve's bikes, while still beautiful, are a little simpler in finish. And they are a bit less expensive. He thinks of them as the ultimate semi-custom bikes, rather than as your final custom bike. This is not to say that he skimps on the details. 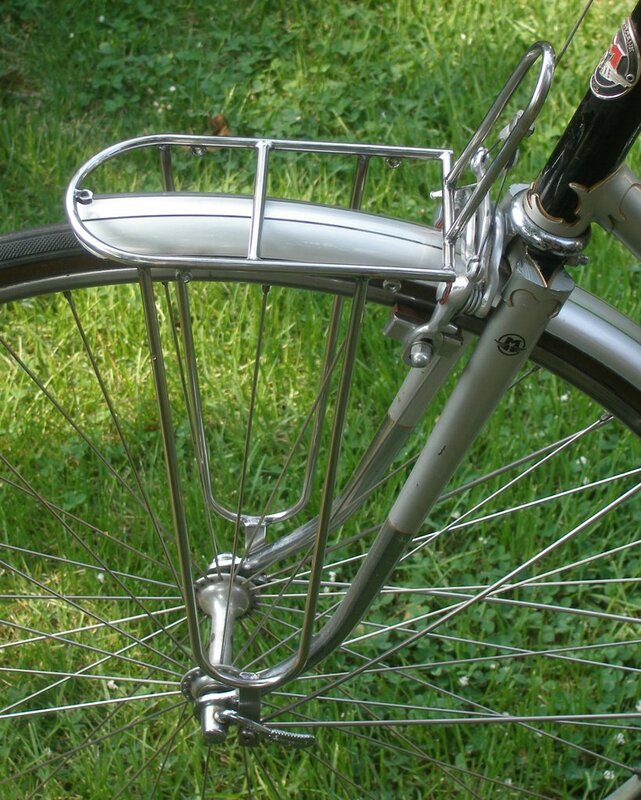 Look at the rear rack attachment. On the other hand don't; it makes Velo Orange racks look ordinary. And the lug work is hardly simple. And note the slap guard and rear cable hanger. Click on the photos to enlarge them. And please tell us what you think. 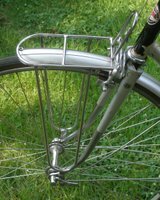 Here are a couple of photos of the new Velo Orange rack mounted on my Motobecane city bike. Click on the photos to enlarge them. We're talking with a couple of new shops with larger production capacities about making these. I want to be able to fill orders in a timely manner, which wasn't always possible with decaleurs and rear racks. The rack works well as is, but we'll make a few very minor changes to improve fit. I'd like it to sit about 9mm further forward to better clear someof the modern "fat" brakes. 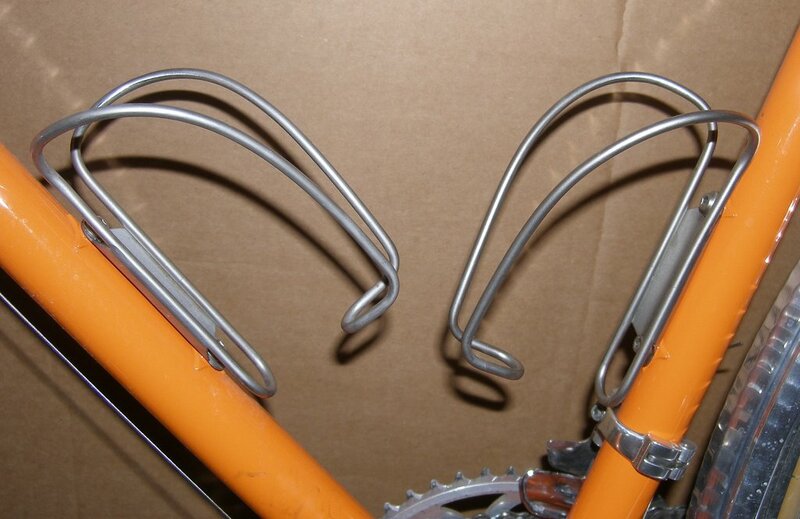 The price for this rack will be about the same as the rear rack. If you're interested please reserve one by sending an e-mail. As usual there is no deposit or obligation required. The reservations help us judge demand so we make the right number in the first run. I think it looks pretty good. How about you? We found a few treasures in a dusty warehouse. The Fiamme stems are among the prettiest bike stems ever made in my humble opinion. One is going on my Ebisu and I'm tempted to keep them all for myself ;<) They are polished to a near mirror finish and accept standard 26mm road bars. $80. 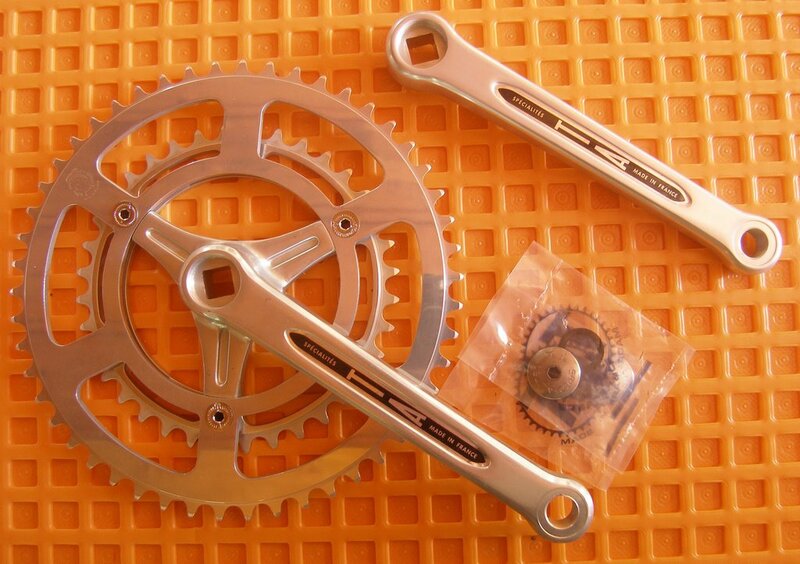 Finally we have a very small supply of TA Professional 3-Pin cranks. This was the old TA racing crank. It uses 116 bcd rings which are available in sizes from 36 to 68 tooth. How do you like our new orange background? I know several of you have been waiting for the classic size 18 oz. stainless steel water bottles. They just arrived and they fit perfectly in every cage I have. Again, they have a logo, but it can be removed with metal polish. Since we're all suffering from tour withdrawal, I thought I'd post a few photos of this bike, that an aspiring racer might have ridden in the early 1970's. This bike is interesting for several reasons. 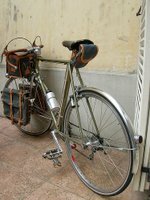 It is the type of bike that evolved into the modern sports tourer, such as the RB-1, Rambouillet, Kogswell P, and numerous others. 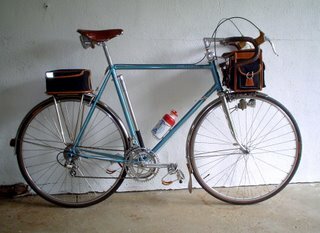 It was built by a company, DANGRE-STARNORD, that prided itself on using all French components, yet the brakes are Swiss. And this bike has three names: On the seat tube it says Starnord, on the down tube is the name of the famous Paris Sport shop; and on the head tube it sports a Victor Cycles of Paris logo, which was a house brand of Paris Sport and had nothing to do with Paris France. Construction is all French sized Reynolds 531, which some aficionados claim rides better than the slightly different British sized tubes used in the rest of the world. As for workmanship, well, let's just assume it was built after a long wine soaked lunch. The ride is pleasant enough, though the long chainstays and thin tubing make it a bit flexible for my weight. Steering is a little quicker than I prefer, but not bad. The Ideal 90 Rebour-treated saddle is almost as comfortable as my Brooks Pro. 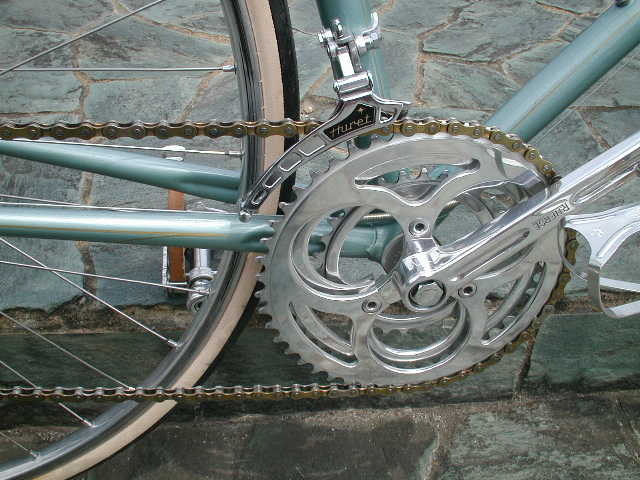 And the top-of-the-line Simplex SLJ derailleurs are smooth as silk. makes one wonder what all the fuss with index shifting is about. The wheels in the photos are not original; those were sew-ups. 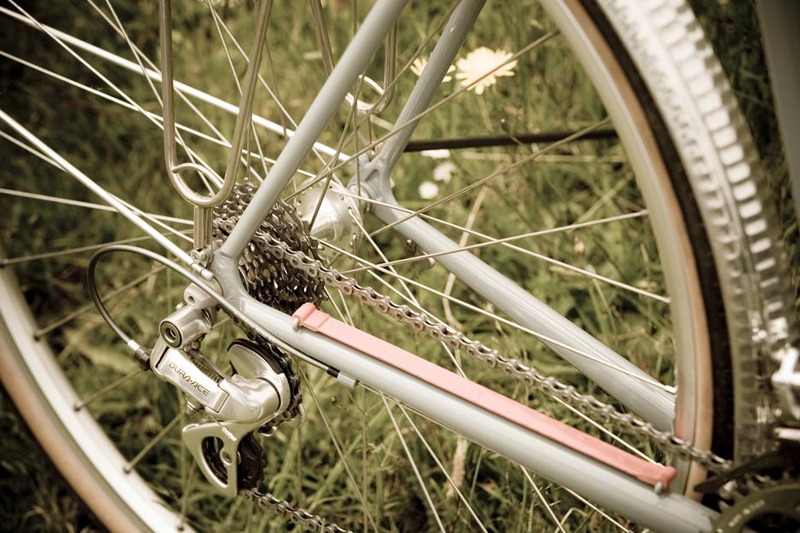 There is plenty of clearance for large tires and fenders as well as eyelets on all dropouts. 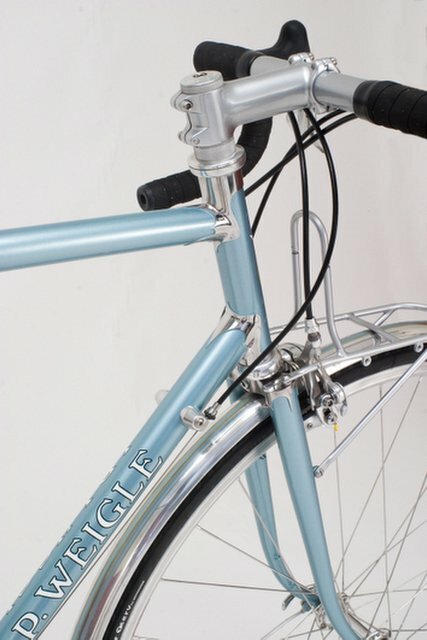 If you eased the head tube angle one degree, you'd have close approximation of a classic sports touring bike. I bought this bike because I wanted to play around with the sort of bike I couldn't afford when I first became interested in bikes, and for the parts. It appears have been ridden no more that a couple of hundred miles. 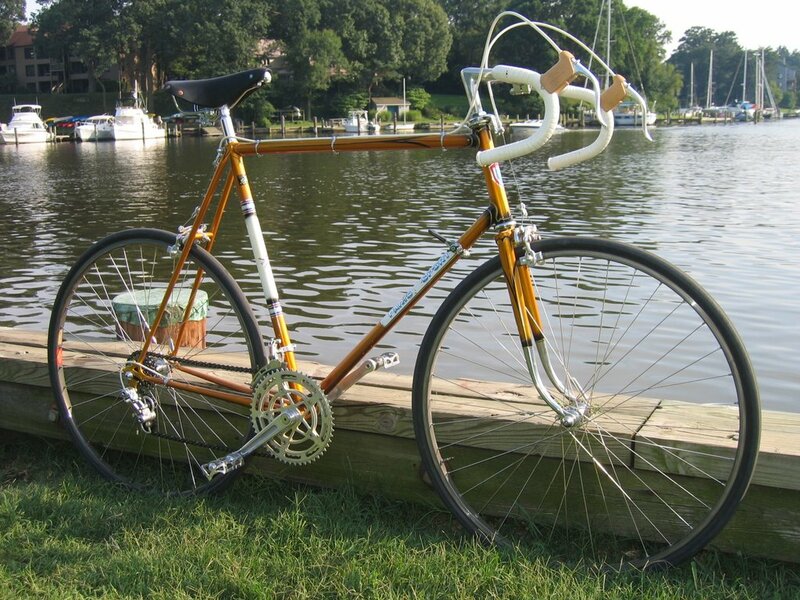 I plan to use the parts to build up a future project, perhaps the prototype Velo Orange frame. Anyone want a French racing frame? A couple of folks have suggested that this bike should be preserved as is. My feeling is that the frame is poorly made and not historically important. The parts would be better used to restore a significant frame, like the stripped Singer racing frame I recently saw. Or they should go on a first class handmade frame. 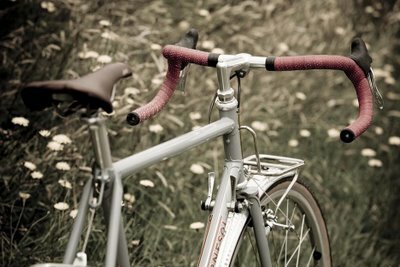 Velo Orange is not about racing, but GO FLOYD!!!!! I've been watching, or following the TdF since I was about 18, and I can't remember a more amazing stage than today's. If you haven't watched it yet, do so tonight. It's worth it. 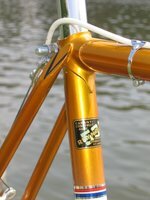 David, who often comments here, found a Peugeot PFN-10 frame made from Vitus 181 tubing in a dumpster. 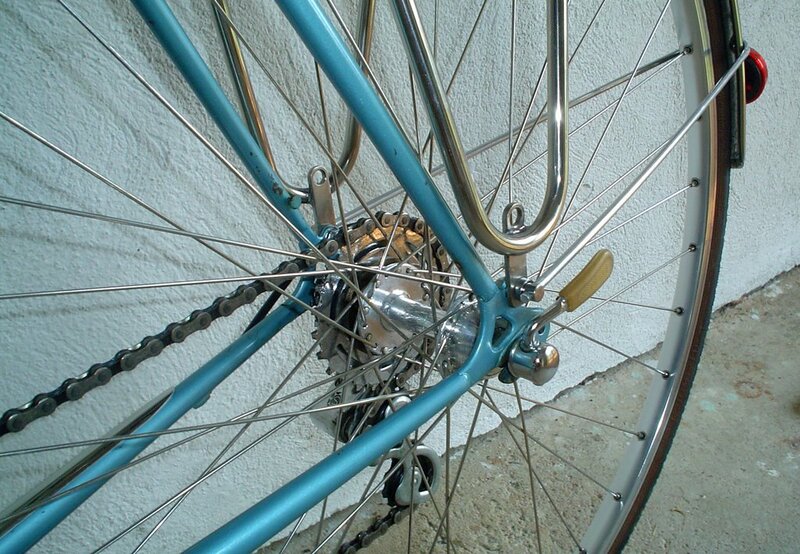 He added a Reynolds 531 fork from a Peugeot PX-10 and found he had a sweet riding French bike. Obviously he's lavished a fair bit of time and money on his project, and the results is a beautiful rando/commuter bike. 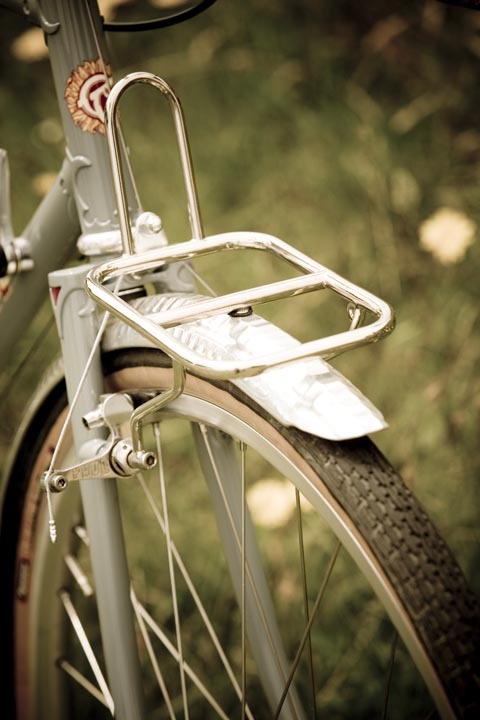 Of course I have to mention the Velo Orange rear rack, decaleur, mud flap, bell mount, and toe clip covers. 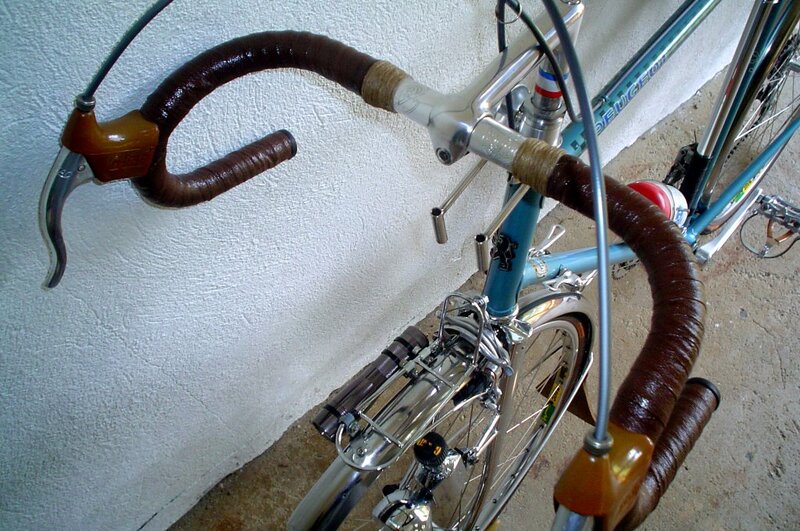 But that custom front generator braze-on is a brilliant addition. 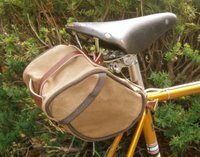 And the Berthoud bags add a bit of class. The Mafac front rack and TA bottle and cage, as well as the Stronglight crank are also notable. If you study the photos you'll find a lot of little details that make this bike special; it was obviously set up by someone who knew what he was doing. 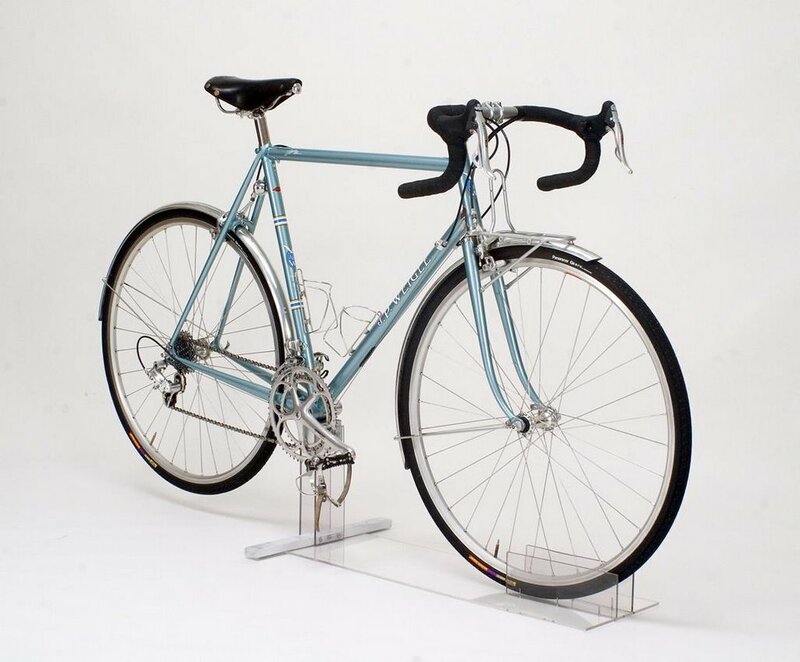 David, who is an ex-racer, prefers the race bike-like fit of this bike with its low bars and tall seat post. Even though David has a very nice brand new sports-touring frame, he's wondering if he should build it up. He's not sure it would be much of an improvement over the Peugeot. He writes of the Peugeot, "...its ignoble provenance adds character." More photos here. And if you want to see what what a PFN-10 looked like when new, here's a link (and look at the stem on the bike at the bottom of this link). This is a rather rare seat post made by the famous French firm of J.P. Routens. Jo Routens, like Herse and Singer, was one of the premier French constructeurs. The firm became JPR when Jean-Paul Routens (Jo's son) took over. 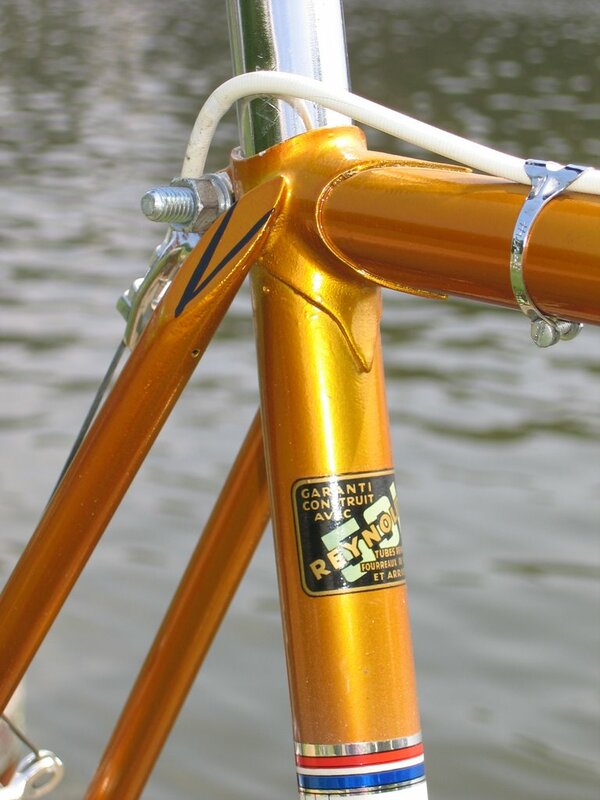 JPR made this post, as well as some very nice tandems and frames in all price ranges. The design of this post is also very unusual as it is a twin bolt post, but the adjustment is from the bottom! 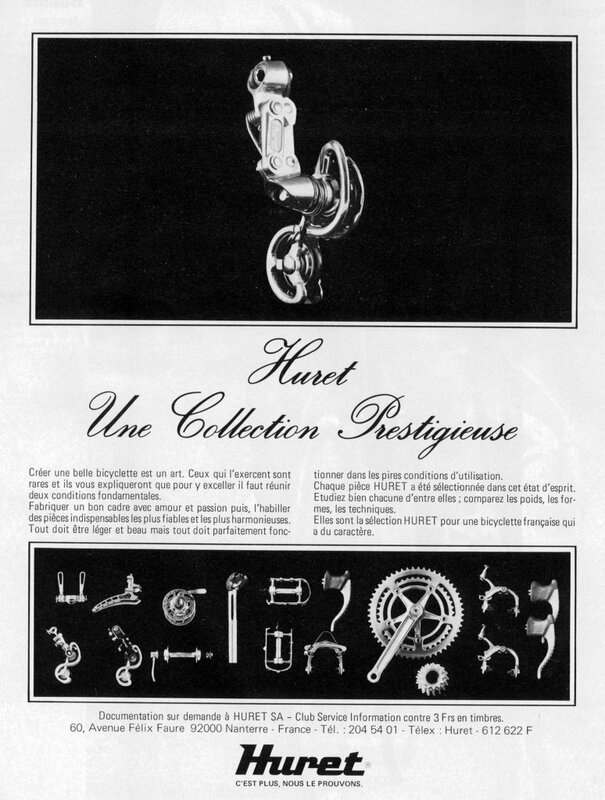 The JPR post was also used in the short lived and rare Huret Gruppo. Did you know Huret had a gruppo? 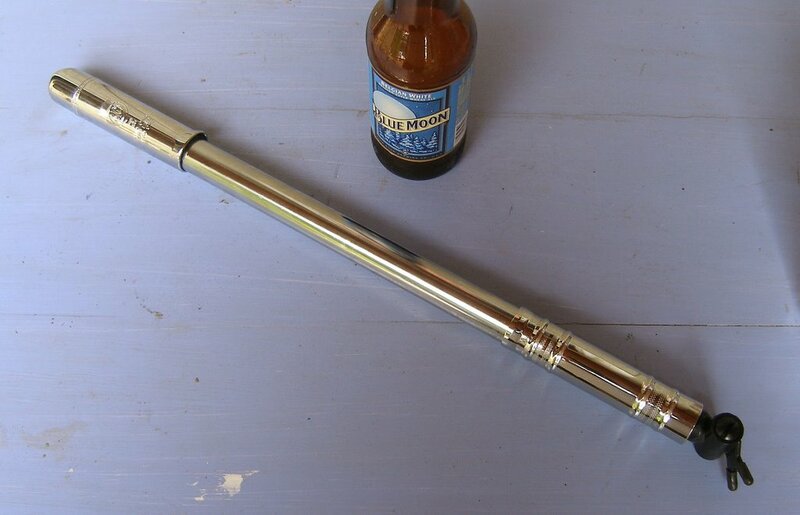 I found a few of these posts and will soon offer them in the Velo Orange store. Click to make the photos larger. 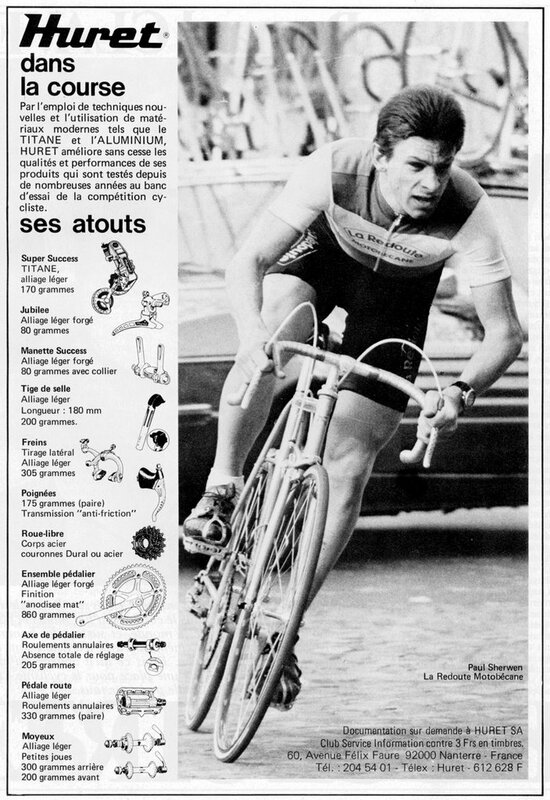 By the way, that's Paul Sherwen, the TdF commentator, in the ad on the left. 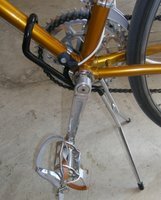 It fits bikes with cantis, sidepulls, centerpulls, or no brakes. It only weighs around 360 grams. 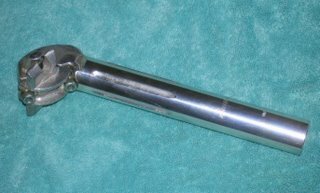 The material is 1/4" 304 stainless steel tube. 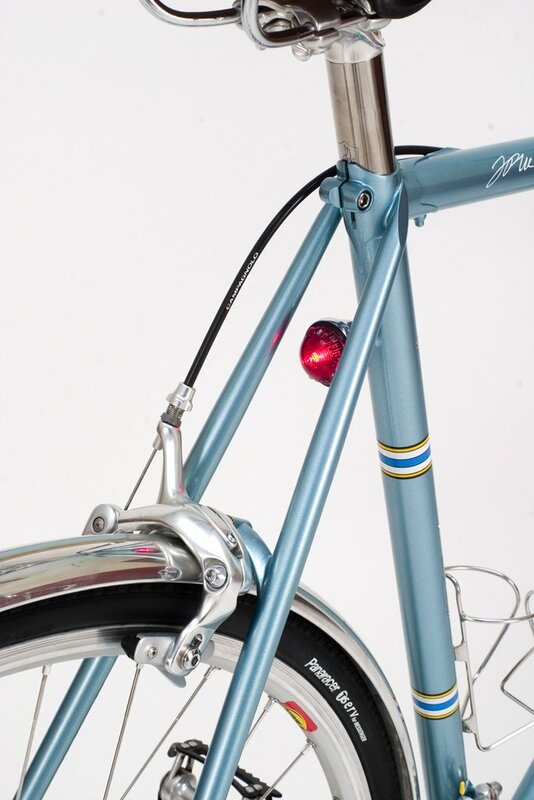 There are threaded bosses for lights on both sides and a proper fender mount. Plus, it's very very shiny. We'll post more photos later. What do you think? 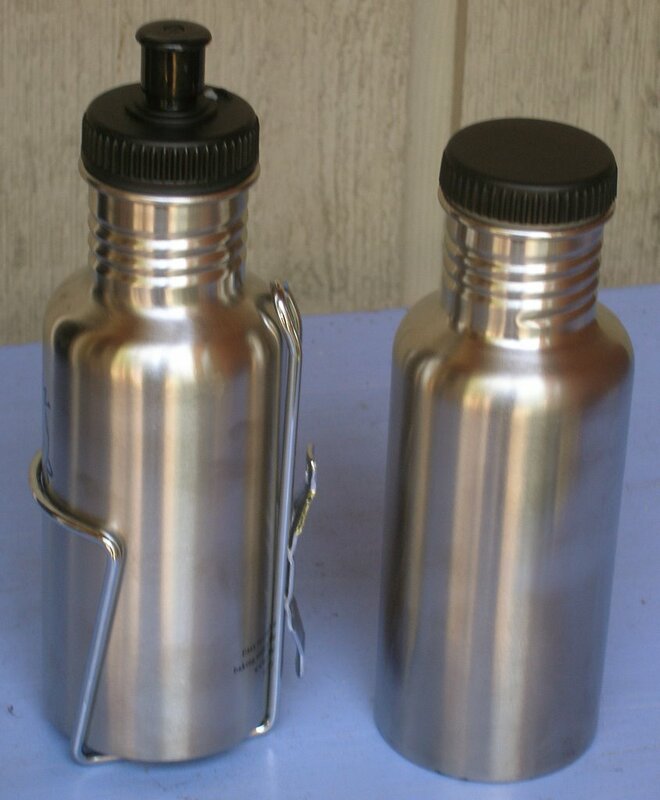 On another subject, I've been looking for a nice modern the stainless steel water bottle for ages. Unlike plastic bottles there is no funky plastic taste from these, even the tops are non leaching. And the tops come in two styles, either a sports top or an old fashioned screw-in flat top. They hold 27 oz. 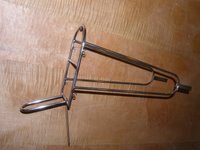 and fit in a standard cage and will last a very long time. We'll even stock replacment tops. $14 in the store. The logo can be removed with metal polish. We'll also have the more traditional 18oz versions of these soon. Did you know that reproductions of old metal French water bottles cost $160.00 in Japan, if you can get one. 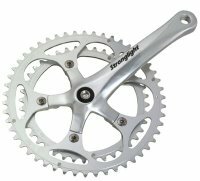 We have ordered a small run of all silver Stronglight Impact cranksets in sizes from 165mm to 175mm. The price will be about $135. I don't have a delivery date yet. One of the best reasons to get these is that they will come with 34/48 Stronglight rings (which are 5spd to 10spd compatible) and are second only to TA rings in quality. Since this initial run is so small I would suggest that you reserve one if you're interested. Just send an e-mail saying you'd like one and what size, there is no deposit required or obligation. I just want to know if I should increase the size of the order. The long awaited shipment of fine Japanese bells arrived today. So we are filling all existing orders plus any others you care to place. If you order your bell with a spacer mount, we will gladly, (and at no charge) install it on the spacer mount, just ask in the comments box on the order form. And yes we have the aluminum bells too. By the way, there is something very cool and rare in the store. If you're an old Campy fan you'll be interested. After years of being the guy who never flats, my luck has run out. Or maybe it's moving to a more urban area where there is glass and stuff on the streets. 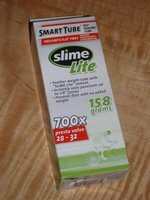 My solution has been to start using Slime Lite tubes. These have a slimy goo inside that self seals punctures up to 3mm wide, so I hope to get far fewer flats. 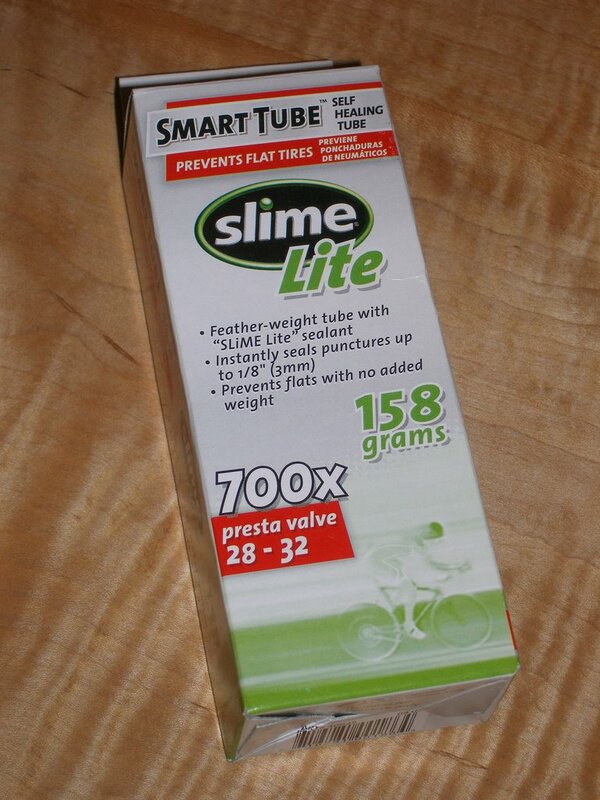 I've never been a fan of regular Slime tubes; at 200+ grams they are just too heavy. But the "Lite" version is listed at 158gm in the 28-32mm size, but only weight 144gm on my digital scale. That's only about 30gm more than a regular tube. At $9.75 they are not cheap, but worth it for me. 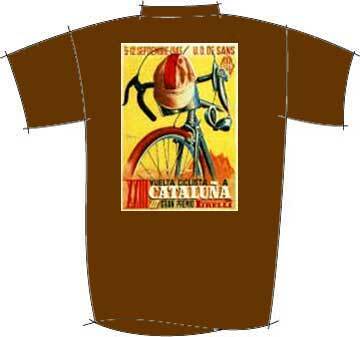 We do have them in the Velo Orange store. We also have good quality regular tubes at $3 each, just so you can stock up when you order other stuff. 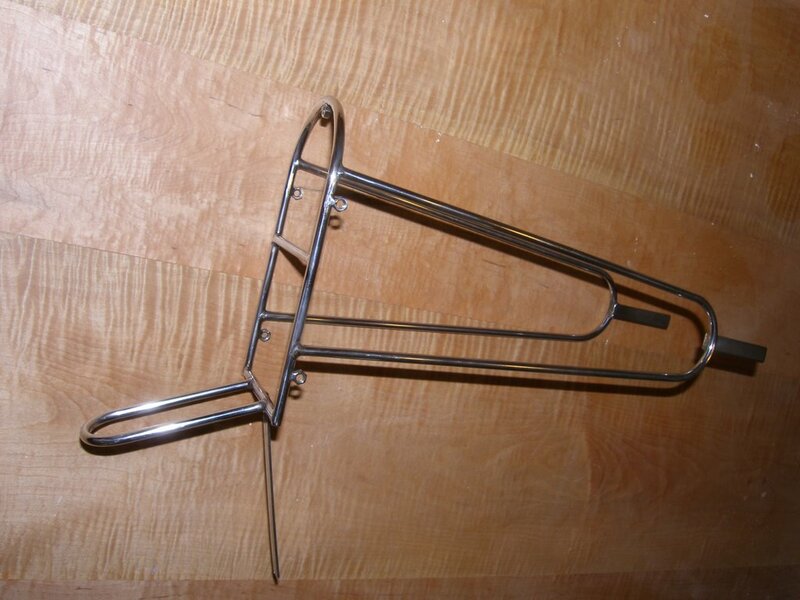 Another one of my favorite little items is the generic two legged bike stand. 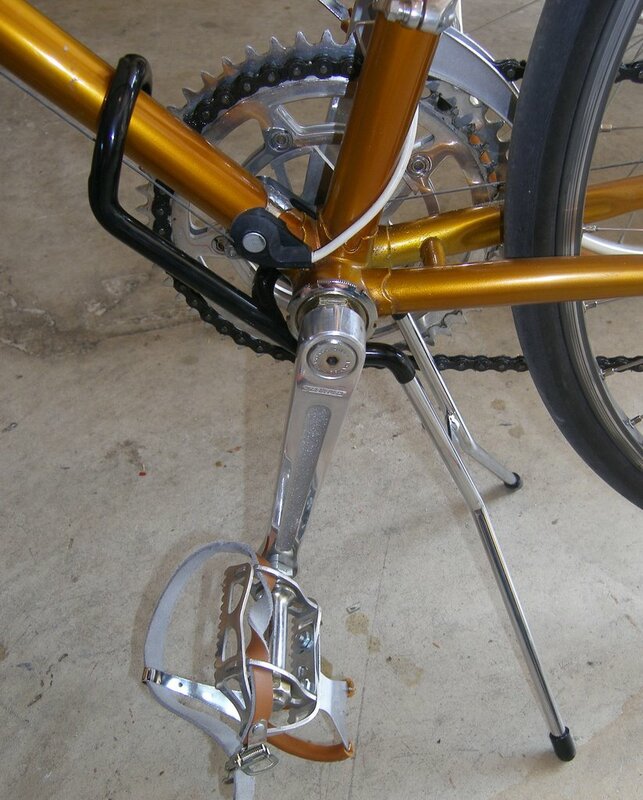 Most of us don't need a full blown repair stand; they take up to much room and are expensive. But this little stand hooks over the downtube, cradles the bottom bracket shell, and lifts the back wheel up. So you can spin the crank, make adjustments to your drivetrain, do an entire overhaul or build up a frame. When you're done it fits in the parts drawer. Okay, it may not be as convenient as a full size professional $200 repair stand, but it only costs $14.50 in the Velo Orange store and will last forever. 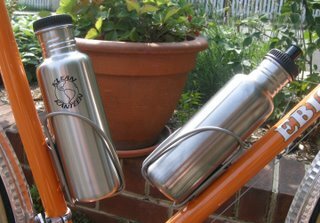 Finally, I've been using Delta Inox stainless steel water bottle cages for a few years now. They are very light, elegant (in a modern way), and don't mark-up water bottles. They come in a silver mat finish that goes well with most newer bikes. $14 in the store. Do you have any favorite "things that work"? 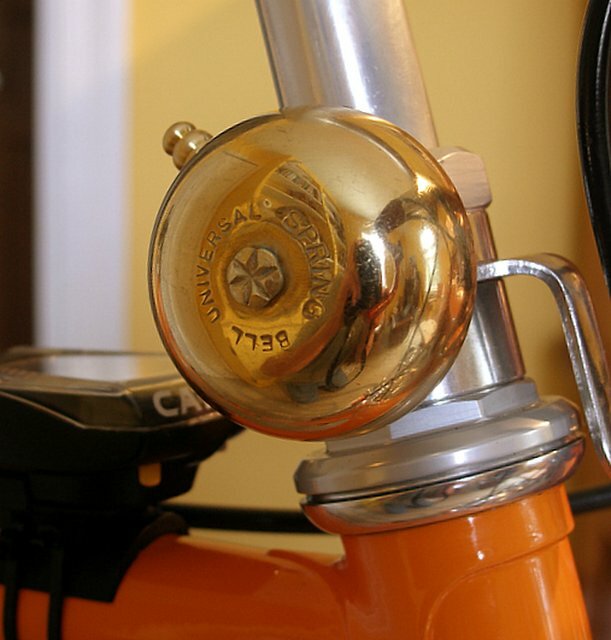 We've added a few more products to the Velo Orange store. We now have Brooks saddles at some of the lowest prices around. 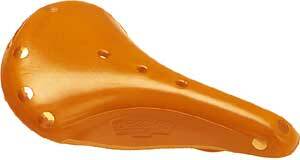 Currently we stock the B17 saddles ($57) and Brooks Team Pros ($115) . We can get most other models in 48 hours and at very low prices, so please e-mail if there's a particular model you need. 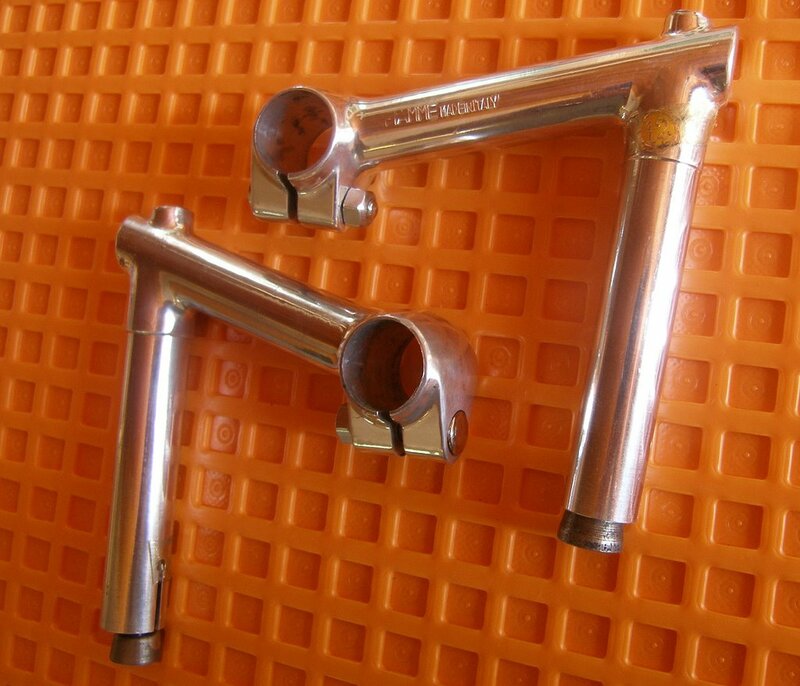 I also found a stash of chrome Silca frame pumps, the old type with the screw on head. They are $32 each and there are only a few in each size and we can't re-order, so get em while you can. You'll need to e-mail to get these; there are not enough of them to put in the store. 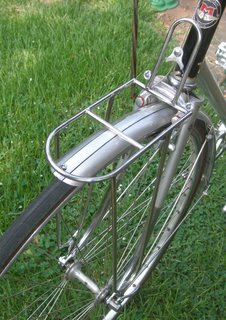 We also carry Berthoud stainless steel fenders now ($50 per pair with all hardware). I'll add those to the store tomorrow. 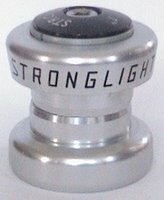 For those of you who ride modern bikes, we stock 1-1/8" Stronglight headsets roller bearing headsets ($45). And we have the famous Stronglight Delta headsets, as well as the legendary A9s. 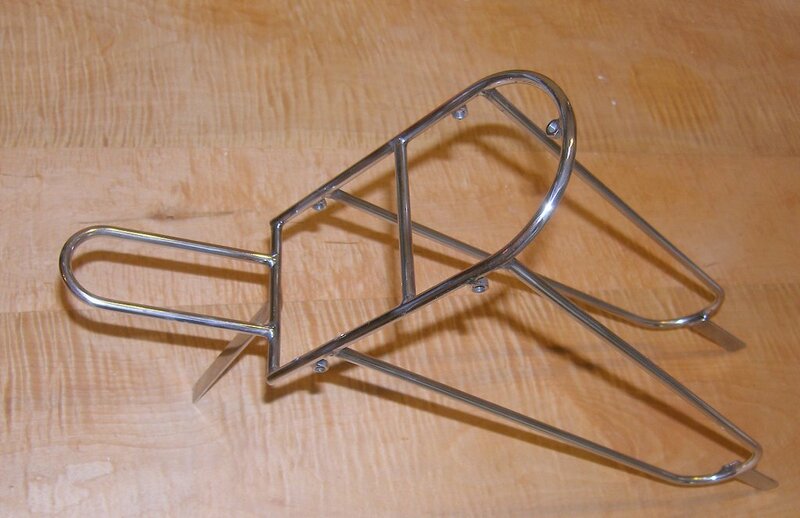 We'll have Delta stainless steel water bottle cages tomorrow. The Japanese Bells have been delayed for yet another week. I am apoplectic about this, and apologetic. Why on earth would it take over two months to get 300 bike bells? Also, we know a number of you have ordered TA track pedals. I'm sorry to say that there are no more of them in th US so far as I can tell. We have plenty of road pedals, but no more track models; sorry. TA pedals are one of those rare items you should buy when they are available. 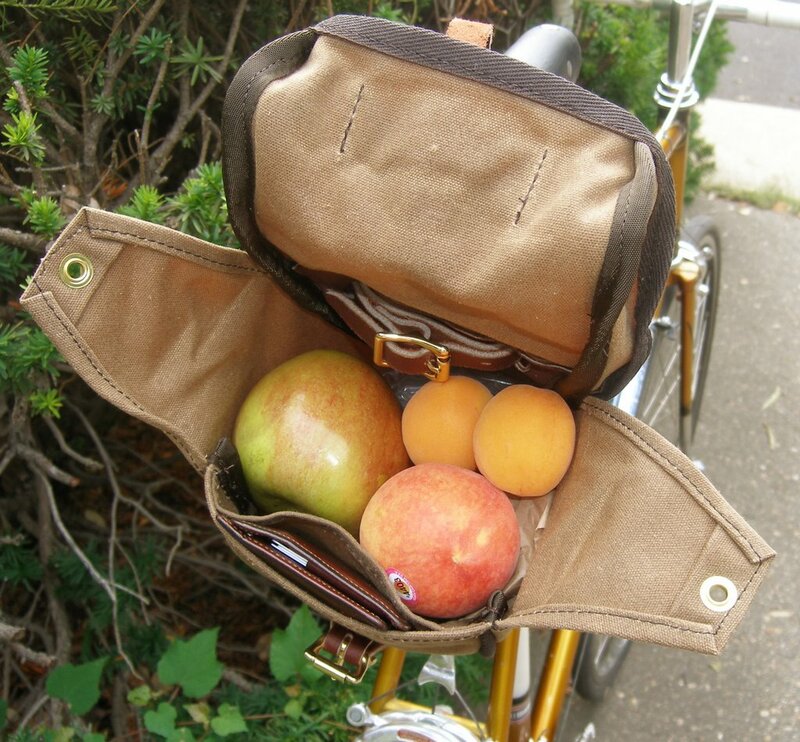 What other products do you think Velo Orange should carry? 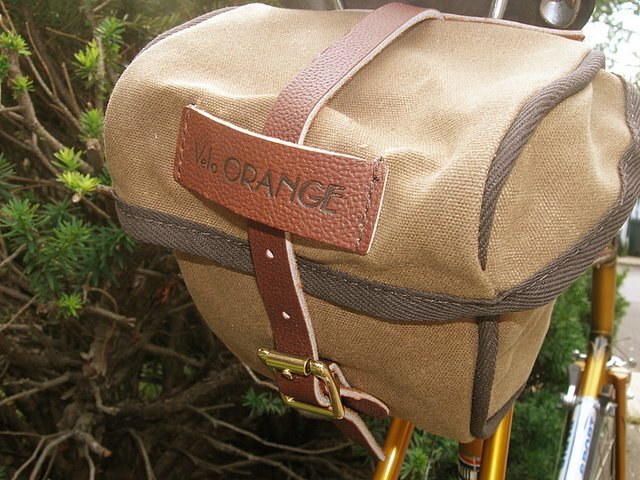 This is our first piece of VO brand bike luggage. The Velo Orange saddle bag is made of thick canvas that matches the color of the classic old TA bag. It has a stiffener in back so it maintains it's shape and a separate pocket for your wallet. there are inner flaps that can be secured to keep the contents restrained on rough roads. The buckles are solid brass, not plated. 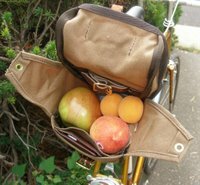 It's about the perfect size for a long day's ride with room for a tool kit and spare tube, a rain jacket, a wool cap, knee warmers, a small camera, a cell phone, and plenty of snacks. If your rain jacket gets wet you can secure it under the extra long top strap. The price is $68 in the Velo Orange store. In the future we hope to make a smaller version, a matching handlebar bag, panniers, and a large seat bag. Where would you find a reproduction 1950 Simplex catalog or a t-shirt with a classic cycle-art poster on it? 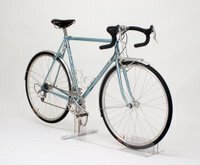 Only at Velo Retro; Velo Retro is an online business run by well known bike collector Chuck Schmidt. In addition to selling catalog reproductions, reprinted rare cycling books, and snazzy shirts, Velo Retro hosts the useful Mavic and Campy timelines. 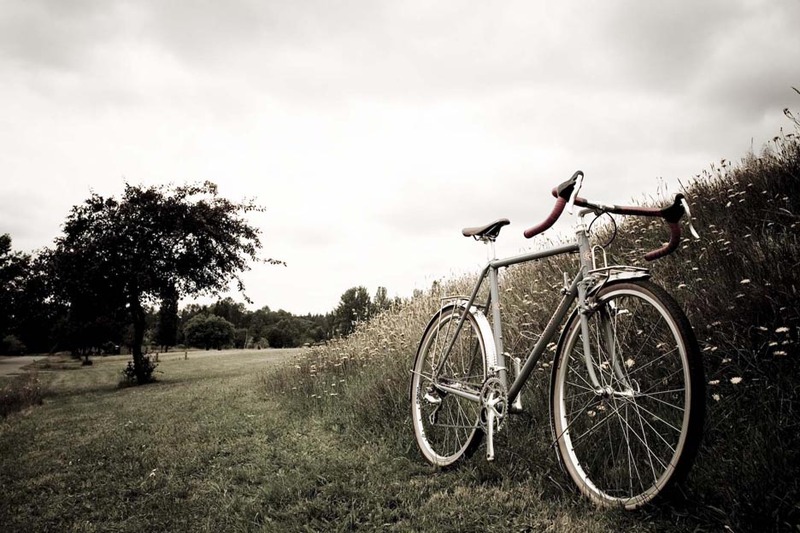 And they have a comprehensive collection of bike related links. Chuck also hosts The Velo Rendezvous events and monthly retro rides. Have a look at the photos of these events. 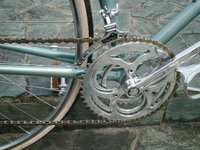 The selection of attractive compact cranks is very small indeed. The photo is of a Stronglight Impact crank. It is a, not well guarded, secret that the Impact is actually forged for Stronglight by Sugino. 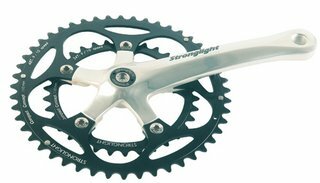 The advantage of the Impact is that it comes with the superb Stronglight chainrings and is available in every size from 165mmto 175mm. Plus, being French, there is a certain "cool factor". 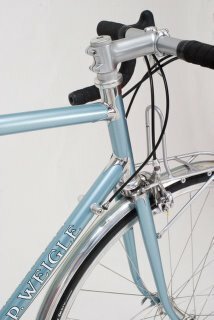 It weighs a reasonable 630gm and uses a 110mm square-spindle bottom bracket. I've tested a set of these cranks on my bike for a month and am very impressed. We've been thinking of asking Stronglight to assemble a run of these in silver with 48/34 rings. They would cost around $110. What do you think? Black rings or champagne rings? Are there other good alternatives? 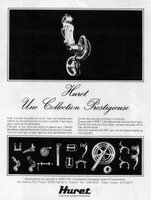 Of course the long term goal is to make reproduction Rene Herse cranksets.